At Auckland, India is in tatters…. On a pitch which seemingly had nothing for the bowlers…. Kiwis scored 500+ - but when it was our turn, the batsmen faltered… biggest disappointment being ‘Shikhar Dhawan’ – on whom we had great expectations after that epic debut…. At some point of time, it was unique - Kepler Christoffel Wessels captained South Africa after playing 24 Tests for Australia. He was the first man to have played One Day International cricket for two countries ~ now we have Ireland players appearing for England and more…..
A character he is – a crowd favourite - Mudhsuden Singh Panesar, [Monty Panesar – the python] – a left arm spinner from Essex, made his Test debut in 2006 against India in Nagpur. Born in Luton to Indian Ramgharia Sikh parents, he is the first Sikh to represent a nation other than India in Test cricket. In 2011 World Cup played in India, there was - Wandavasi Dorakanti Balaji Rao, a Madrasi ! – who had played for Tamil Nadu and Railways in Ranji trophy – played for Canada against WI. In 2012 Nethula made his debut against Zimbabwe, playing for New Zealand. The leggie’s full name is “Tarun Sai Nethula” – born in 1983 in Kurnool in Andhra Pradesh State in India. On a pitch where Dhoni decided to drop Ashwin and play Ravindra Jadeja as a specialist spinner, Indians would be playing a leggie – Ish Sodhi… and by the time, you read this post, Ish Sodhi has fulfilled his parents' wish of their son playing international cricket against India, the country of their birth. Ish, the leg spinner, plays domestic tournament for Northern Districts in Napier. His father Rajbir Singh Sodhi, is a businessman and mother Simrat has a teaching job. 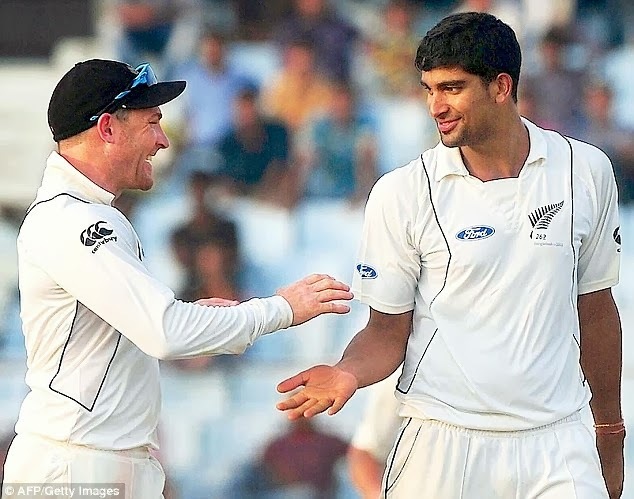 The Indian Kiwi - Ish Sodhi has played five Test matches for New Zealand, having made his debut in October 2013. The family migrated from Ludhiana to Auckland in 1996 when Ish was just four. He had stated that it will be a huge learning curve knowing well that Indian batsmen, known to be good players of spin- but they may not try to have a go at him, having lost wickets even before he prepares to bowl. Dipak Patel and Jeetan Patel have been New Zealand cricketers of Indian descent before Ish. Whether Ish is able to turn and beat them or not, India looks totally embarrassed after the poor ODI performance and the batting debacle here. Inderbir Singh Sodhi has so far made 152 runs with a 50 and has taken 11 wickets prior to this test.